I am, as the saying goes, as pleased as Punch to see this plate. I remember when a child seeing Punch and Judy and being scared stiff of Mr Punch's voice. I haven't liked harsh or loud voices since. 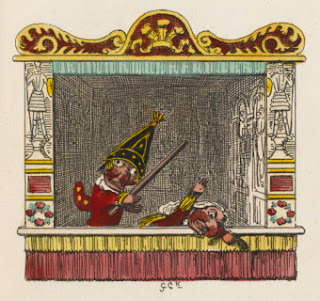 That apart, Punch and Judy is brilliant to watch and, like pantomime at Christmas, one of those traditions that is so much part of my generation's background. Sheer nostalgia sent me to Wikipedia and a very interesting read it was. What an adorable plate. The somewhat manic look of the characters is brought back in proportion by the welter of Aesthetic detail. I am always a sucker for anthropomorphic frogs. These reached their apogee in Starewicz's silent animated film The Frogs Who Wanted a King (Les grenouilles qui demandent un roi). Boy found a little treasure indeed. Reggie, I love it and I am sure your guests will. It is my favorite! And I adore them all!! I have loved all these saucers etc. ; but this one is my favorite! When I was a pre-schooler, my next door neighbor had four place settings of a child size set of Blue Willow for luncheon parties with two other neighbors and me. It brings back a lot of good memories with Ovaltine in the teacups and such. I never liked Punch and Judy as a child and could not understand why adults thought it was such a treat. 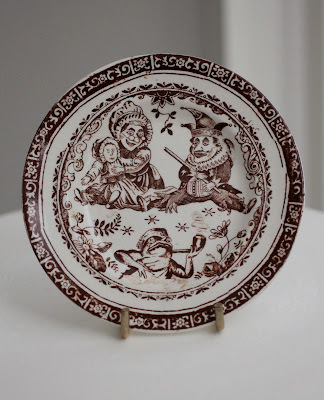 Nonetheless, the plate is very charming. Good find, Boy! Punch and Judy always scared me as a child but I loved playing tea, and the plate is adorable. I never took to Punch and Judy either, but your little plate is delightful! Is there a registration number? 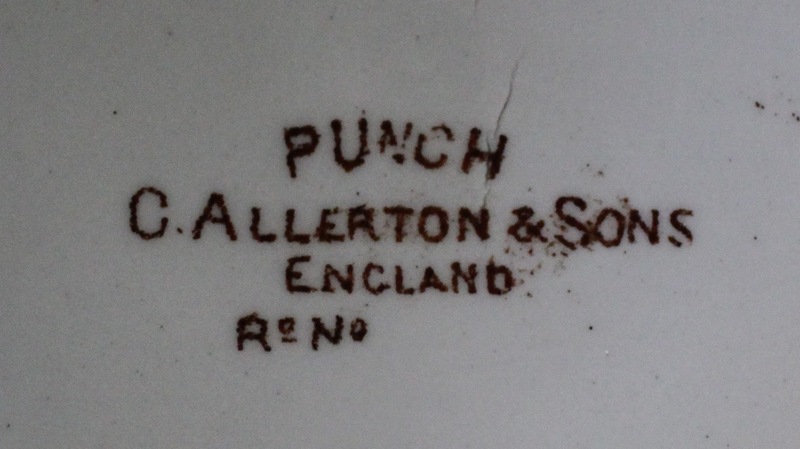 If so I can check it and tell you what year the pattern was registered. If you ever decide to open a B & B, it would be nice to serve little cookies on or present the bill to fine guests. I love children's tea services...what an adorable plate! Definitely one to serve Christmas mince tarts on during the holiday season. There's nothing quite as camp or as festive as English Panto characters at Christmas! SO charming!! Such a fitting post after just returning from London where I saw many Punch and Judy references!! Hope you're enjoying this marvelous day!! It is excellent. I just love your informative and well-written posts. A brown transfer-print is one of my favorites. The palte is sweett, but what I really love is the photos of the imari! Can't have enough! Reggie, where are you? It has been two weeks since your last post! Concerned about you.